The Ambassador program is based on the Seerah (Life History) of the Prophet Muhammad (May Peace be Upon Him). During his life, Muhammad (May Peace be Upon Him) would send Muslim Ambassadors to represent Islam and the Muslim community to the rulers in Persia, Rome, and Africa. These Ambassadors would speak about Islam, represent the Muslim community, and build relationships with these people who held positions of power and influence. 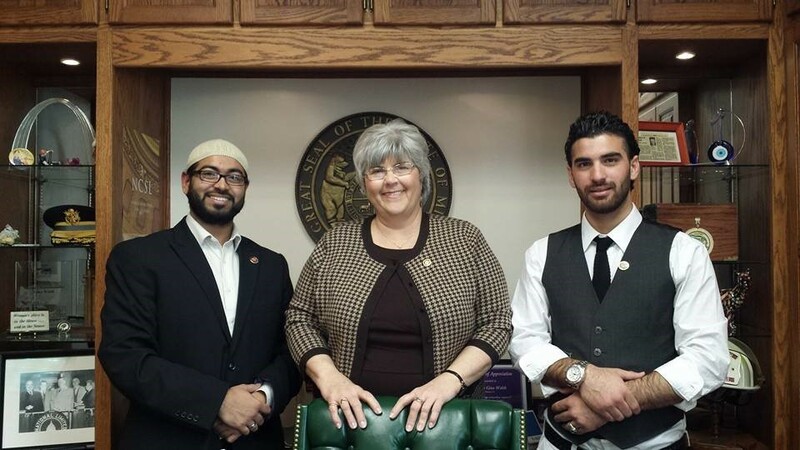 Today, sadly few American Muslims ever meet their elected officials. Even though we live in a Representative Democratic society which is built on people in power having relationships with their constituents. Many elected officials never meet a Muslim and have limited understanding or worse, misinformation about our Islam and the Muslim community. That’s why we need you to join the CAIR-STL Ambassador program. By becoming an Ambassador you will help build a long term relationship between American Muslims and our elected officials. You do this by holding meetings with them to build relationships and discuss issues of concern. CAIR-STL will provide you the training to meet your elected officials, will assist in organizing meetings, and develop discussion points. Become a CAIR-STL Ambassador today by clicking on this link below and filling out the form. You will then be contacted by a CAIR-STL team member who will start the process with you. The Council on American-Islamic Relations and the grass-roots campaign #BringThemHere hosted a rally on Sunday in the Delmar Loop to welcome refugees already settled here and to reiterate their hope to see more Syrian refugees admitted into the country. He said the country’s geographic size and economic resources make the U.S. capable of hosting greater numbers of Syrian refugees. CAIR-Missouri is working on a project with Baitul-Mal (“House of Good”) to relocate Syrian refugees to homes in North County because it is less expensive and has a larger network of Arab and Islamic communities, Syed said. Give Your Children Leadership Skills this Summer! Don’t Have Them Waste Their Time on their Phones. Join us with a summer of fun sisterhood and brotherhood activities while being involved and learning the sunnah and path of our beloved Prophet (pbuh). Boys and girls from 5th grade to 12th grade are encouraged to sign up. Camp supervises will be brother Faizan Syed(executive director of CAIR-MO) and sister Nour Alhiyari (Islamic studies teacher) along with parent volunteers. Maximum capacity for this camp will be 30 total kids based on first come first serve bases. Parents will be expected to drop off and pick up their children from the daily activity location. Most programs are held at Darul Islam Masjed (517 Weidman Rd Ballwin MO). Social Activities: include zip lining, paint balling, canoeing, swimming, hiking, and team building camp out. Community Activities: include public speaking, interacting with the media, meeting our elected officials, and launching your own Dawah projects. Majority of the events occur in Darul Islam Masjed located at 517 weidman rd, ballwin MO. Parents will be expected to drop off and pick up their children from the daily activity location. All events occur no further than 20 miles from Ballwin MO. Check schedule below to see all the event venues. Financial aid is available. If you cannot afford above costs please mention the amount you can pay when registering below. 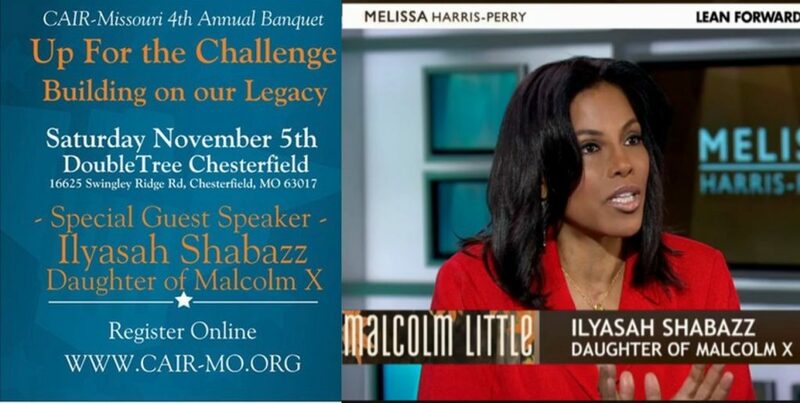 Special Guest Speaker Ilyasah Shabazz, Daughter of the great civil rights leader, Malcolm X. Join us for our 3rd Annual, “Sharing Ramadan” open house at the Daar-Ul-Islam Masjid. This annual event hosted by the Islamic Foundation of Greater St. Louis (IFGSTL) and the Council on American-Islamic Relations in Missouri (CAIR-MO) is a yearly occasion that brings peoples of all faiths or no faiths to visit their local Islamic Center and share in the breaking of the fast meal. Ramadan is the holy month in the lunar Islamic Calender. During this month Muslims will abstain from food, drink, and sexual relationships with one spouse from dawn till sunset. Muslims strive to build a closer relationship with the Allah (God) through the fasting and increased prayer, charity, family and community building, and being God conscience. This event is free and open to the public. We encourage American Muslims to invite your friends, neighbors, co-workers, family, and the general public to the program. An Alabama man facing felony hate crime charges in Missouri pleaded guilty instead to misdemeanor assault charges after he was accused of punching a Muslim man, The Columbia Daily Tribune reported today. Randall Heath, 29, of Salem, was sentenced to 40 days in jail. Heath was arrested as he appeared in Boone County Circuit Court on a drunken driving charge, according to The Associated Press. The St. Louis Chapter of the Council on American-Islamic Relations (CAIR-St. Louis) in September welcomed the hate crime charge. On behalf of the St. Louis Muslim community, which is comprised of 18 Islamic Centers, and over 100,000 thousand Muslims from every ethnic background in the world, we would like to share our condolences regarding the loss of Michael Brown. We know that unarmed black men are killed at an alarming rate in this country. We recognize that all life has value. We also recognize that the officer has a right to due process. The Prophet Muhammad once said we must “help our brother, whether he is an oppressor or he is oppressed… [We should help the oppressor] by preventing him from oppressing others.” We thank the FBI for launching a parallel investigation into the shooting of Michael Brown and hope that a thorough investigation will be completed, the truth will be disclosed, and justice will be served. We will pray and stand with the Ferguson community in this time of much needed healing. The Holy Qur’an tells us that humanity is like one body, when one part of it is in pain, the whole body should wake up in a feverish state. Islam is a way of life that invites all of humanity to it in order to establish justice, build meaningful brotherhood of all people, and worship God alone with no partners. We the Muslim community in Saint Louis share your family’s pain. Your family’s sorrow is our sorrow. We pray that the Most Merciful strengthens your family and the St. Louis community with patience to endure this sad time. We wish you peace and safety. #STL4Syria is a grassroots movement whose purpose is to bring as many Syrian refugees to St. Louis as possible. The first community meeting will be held on Saturday October 3rd at 6:30 PM, location TBA. As Americans we believe this is unacceptable. The U.S. has the largest economy in the world, large land mass, and the ability to integrate refugees much better then any other nation in the world. The U.S. is emotionally, morally, economically, militarily, and strategically invested in Syria more then most nations in the world. It is only natural that the U.S. leads in bringing Syrian refugees to it’s soil. During the Bosnian Genocide, St. Louis became the home for tens of thousands of Bosnian refugees. This community was able to find peace, security, job opportunity, education and have been able to rebuild their lives. The influx of these refugees into St. Louis in the 90s has also revitalized the areas where they resettled into, especially South City and the South County areas. St. Louis is the perfect destination for the now Syrian refugees who need a home and St. Louis needs them in order to help revitalize the city.